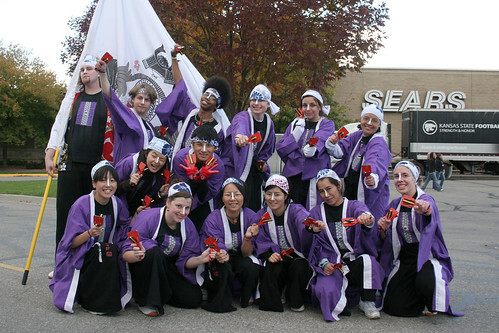 On November 6th, the Yosakoi group performed as the opening entertainment for the annual Hunger Banquet, put on by K-State Fair Trade Advocates. The banquet, which is an activity designed by the Fair Trade group Oxfam, is hosted at various universities around the country with the goal of raising awareness of global hunger and poverty. This year, Fair Trade Advocates invited Yosakoi to perform as an opening treat for those who attended the banquet. Six members of the group performed Yocchore for an audience of about 70 people. Despite some initial difficulties with the sound system, the audience responded warmly to the dance, and afterward several attendees told us the dance was their favorite part of the event.